This deluxe eyeshadow palette comes with 28 cool color story shades, complete with a how-to tutorial pamphlet written by the SEPHORA PRO Artists. Leading artists, limitless expertise. Fifteen top makeup artists handpicked for their superior skill, unprecedented creativity and ability to inpire through education make up the Sephora PRO team. Influenced by fashion, photoshoots, and social media, Sephora PRO Artists came together for the first time ever to present This PRO eyeshadow palette for any photo-ready need. It features 28 high pigment, high performance shades in chrome, matte, shimmer, and satin finishes to create endless looks in cool mattes and gorgeous iridescent textures that epitomize sophistication. 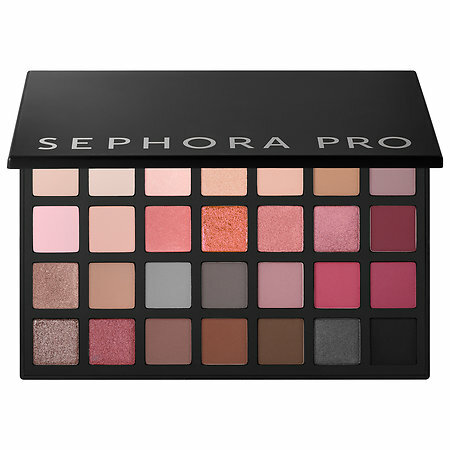 The palette comes with simple instructions application techniques written by the Sephora PRO so you can achieve unique looks with ease. The matte shadows feature kaolin (a clay) to absorb skin oils for a long lasting matte finish. They also contain Nylon Powder, which contributes to the smooth texture and soft feel of these matte powders. Each matte shadow contains antioxidants vitamins A and E. Coconut and safflower seed oils offer conditioning properties and allow the satin shadows to spread evenly. Sericite has been added for a smooth, silky texture to the satin shadows. High impact pearls add to the vibrant finish of the shimmer shadows. And emollient esters have been added to enhance the luxurious texture of this type of shadow powder and boost its adhesion. Each type of shadow contains anti-oxidants vitamins A and E.
This set contains the following colors: Linen, Powder, Seashell, Tulle, Latte, Flax, Violet Gray, Ballet, Cashmere, Tea Rose, Pink Champagne, Rosé, Orchid Mist, Croquis, Ash, Mushroom, Fog, Graphite, Heather Grey, Mauve, Orchid, Moon, Rosewood, Hot Chocolate, Espresso, Sketch, Obsidian. This palette is fantastic. It has so many gorgeous colors in pinks, grays, metallics, satins. you name it. I love how pigmented the colors are and I love how well they stay on. This palette is worth every penny. And I am going to say the same of the warm palette too. Both are exquisite. It is very good what the artists did. They put together some great colors and expecations to be met and SEPHORA met them. My favorite color in the Cool Palette is Orchid Mist. It is a gorgeous silvery mauve that looks great with green eyes. A lot of the items look great with green eye too. Makes me happy.